Blaine Pedersen was elected as the MLA for Midland in 2007 and re-elected in 2011 and 2016. In 2016 he was appointed minister of infrastructure and now is minister of growth, enterprise and trade. 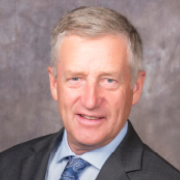 With more than 30 years farming experience in cattle and grain operations, Pedersen is an active member of his community, serving in many livestock organizations and groups such as Kinsmen, Toastmasters, 4-H program and a local housing corporation. He and his wife Dianne have three children and five grandchildren.